Remember I told you I had butterflied a chicken and was planning on grilling it under a brick? Well now I’ll show you how I did it. As I mentioned the other day, Pollo al Mattone, or Chicken Under a Brick is a Tuscan style of grilling chicken. The chicken cooks quickly since it is flattened under the weight of the brick and you end up with crispy delicious skin and juicy, perfectly cooked meat. What more could one want from a chicken? My first step was to marinate the chicken with olive oil and herbs. 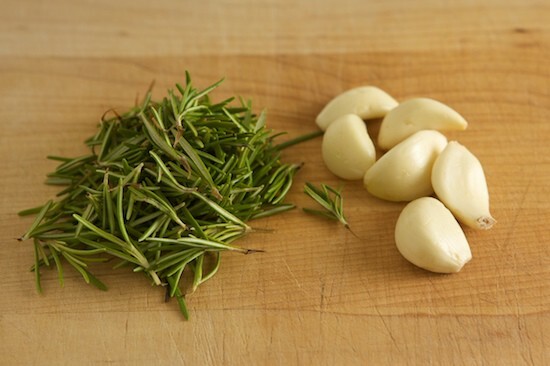 You can use any combination of herbs you like, I just used a simple mixture of garlic and rosemary. 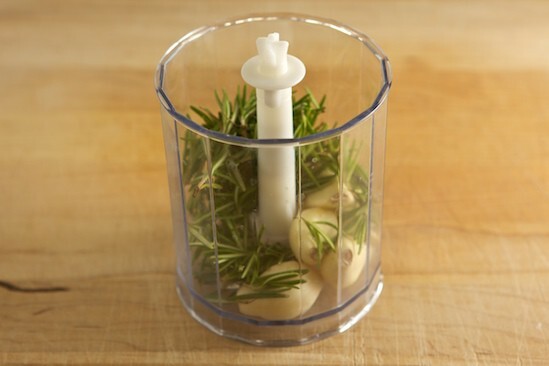 First I stripped the leaves from 5 or 6 sprigs of rosemary (about 1/3 cup loosely packed) and peeled six cloves of garlic. I could have finely chopped everything by hand, but the lazy person inside of me decided a mini food processor was the way to go! A few seconds later, I ended up with finely chopped rosemary and garlic! If you don’t have a mini food processor, just chop everything up by hand and/or pound it with a mortar and pestle. Next, I stirred in about 1/2 cup of extra virgin olive oil. Now for the chicken! If you’ve never butterflied a chicken, watch this video. See how easy it is? After cutting the chicken, I rinsed it and patted it dry with paper towels. I also folded the wings under the bird so that the tips won’t burn on the grill. Here is the inside of my beautifully butterflied bird. Doesn’t it make you want to rub oil all over it? I thought so! I poured about half of the marinade over the inside of the chicken. Then rubbed it all over, making sure to coat every single part of the bird. Next I flipped it over and rubbed the remaining marinade all over the outside of the chicken. 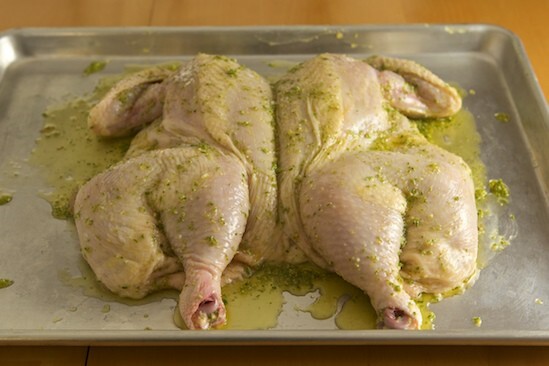 After the entire chicken is well-coated with the rosemary-garlic oil, you can cover the whole pan with plastic wrap or slip the chicken into a large plastic bag and place it in the refrigerator. Try to let it sit for at least a few hours. 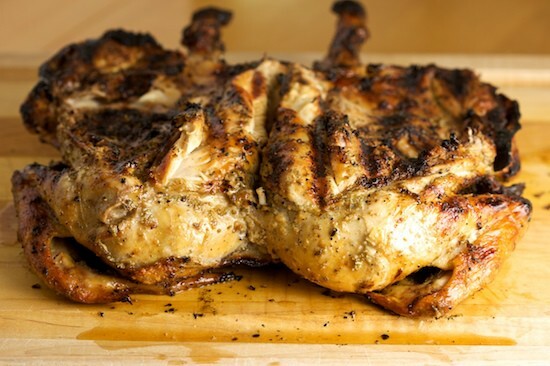 When you’re ready to grill the chicken, take it out of the fridge and rub some lemon juice all over it. Right before it goes on the grill, sprinkle both sides liberally with kosher salt and freshly ground pepper. Prepare your grill (gas or charcoal) for direct medium-low heat. 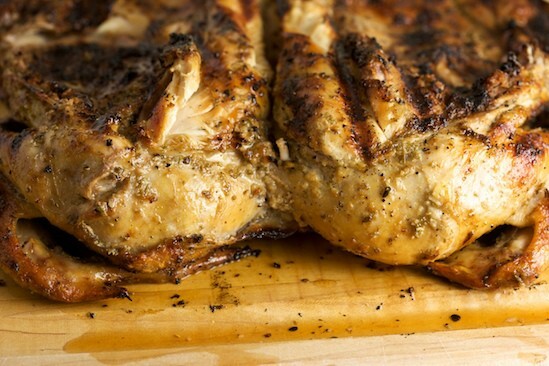 Allow as much marinade as possible to drip off the chicken before placing it on the grill. 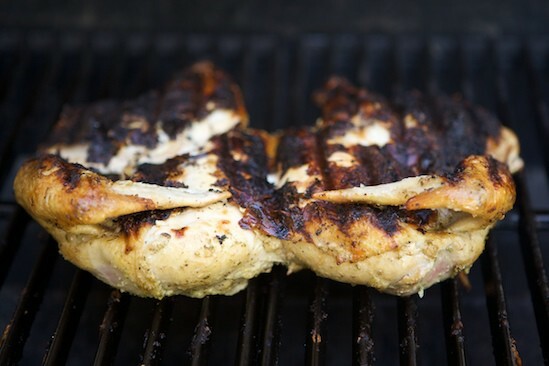 Put the chicken on the grill skin side down and watch for flare-ups. You may need to move the chicken around a bit until the flare-ups die down. 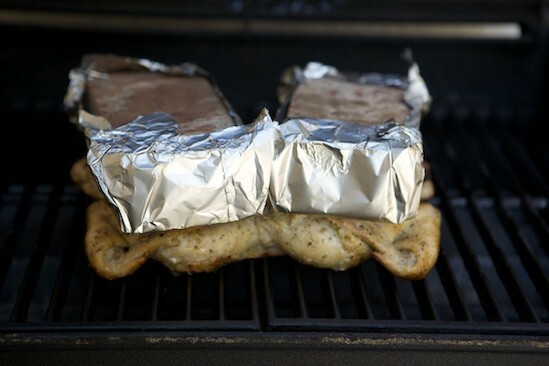 Once the flare-ups stop, put two foil-covered bricks directly on top of the chicken and allow to cook undisturbed for 15 minutes. Remove the bricks from the chicken and carefully lift it up to check the skin. The skin should be well-browned and crispy. If so, it’s time to flip the bird! Mine was a little more than well-browned when I flipped it over! Ooooops! But we’ll just pretend that it’s perfectly browned like the last one I grilled (and of course didn’t photograph). When you flip it over, you don’t need to put the bricks back on the chicken. Just let it finish cooking until the internal temperature reaches 165 degrees…it will probably only take about 10 minutes. As you can see, I flipped the wings back up on top to keep them from burning. Not sure if it’s necessary, but it was easy enough to do. When it’s finished, let it rest for ten minutes before carving. Then divide it up and enjoy! You can use any marinade or rub you want with this chicken. You could even brine it first if you want. And if you don’t have time to marinate it at all, that’s fine, too. Just rub it with oil and herbs right before you grill it. Have fun! I love doing chicken this way. I have to have it once a week! Great photos of your method. I think this looks more fun than roasting a whole chicken. Thanks for posting!!! Looks so tasty! Why do food bloggers insist on overloading their recipes with pictures? Could you edit yourself and include pictures only if they help convey how to do the recipe? Is that even possible? Jojo...nope. Can't be done. Have a great day. I loove my mini food processor - I still like to chop and use a mortar and pestle too - but it's nice when you just need something quick! I think that every picture just makes it more clear as to how to follow the recipe and it shows just how delicious the food is. Don't change a thing! Your chicken looks great - I will definitely have to try this method for cooking chicken... Thanks for the photographs of the whole process! As the Beatles sang: "Get back Jojo!" The pictures make the post even more appetizing. Love cooking chicken this way, even turkeys. Looks so amazingly good. I'll make it soon. It looks absolutely delicious, but the food scientist in me is seeing a possible red flag. Please, for safety sake, never return the bricks onto the already cooked side, cause if you do, and I know you didn't say to, if you do, please make sure to flip it over one last time to heat well again over the coals any meat touching the foil covered bricks as those bricks could recontaminate the cooked meat.I don't know how many of you have ever had the "joy" (not) of Salmonellosis, but it isn't nice and an even bigger concern would be Campylobactor jejuni, 2 weeks of bloody diarrhea. Be sure all material touching any juices of the raw chicken are always heated thoroughly. there's a Georgian dish called Chicken Tabaka where you fry a chicken under a brick - and it's amazing - I should try grilling it next time I'm at my parents' house! 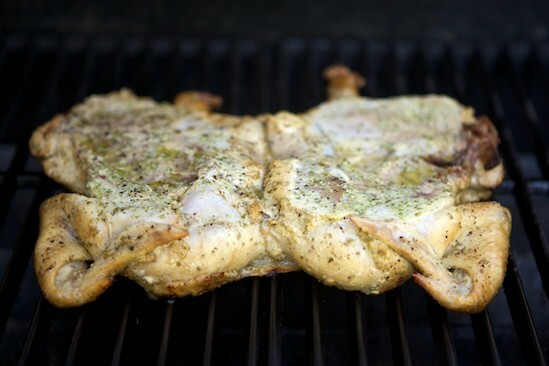 They've got the grill :-) The photos looks mouthwatering and now, I'm craving this chicken for breakfast! Yum. I personally think rosemary and chicken were made for each other. Whenever I cook a whole chicken, I have trouble deviating from my rosemary as the star seasoning...it's just so heavenly. I think I need to try to use this method again for preparing chicken. Tried it once ( a long time ago when I had no idea what I was doing in the kitchen) and it wasn't so great...but this looks so wonderful I should try again! I love this dish in several iterations I have tried but now that I have two infants it is not friendly... I am back to roast chicken which i can get in the oven in a snap! I'll try to handle the picture issue a little more tactfully that Jojo up there...I do enjoy seeing the pictures, and I do see how the can be useful for step by step processes such as this one. However, I do have one critique. With a post this long, I think it would be a good idea to break the post up, with something like a "Click here to read the rest" type link at the bottom of the post. Its a little frustrating (that might be the wrong word) to scroll so far down on the front page to see what other recent posts you have been publishing.Other than that, great blog and great recipe! Whoops... Now that i've made it farther down the posts, I see you have done it with other lengthy posts that you have written. Perhaps this one was just a mistake? Jason: Thanks for your feedback! I always leave my latest post 'uncut' to make it easier to read and then shorten the rest to make it easier to browse quickly through my earliest posts. If it's a super long post (like the ones I do for The BBA Challenge), I'll usually shorten it right away. Valerie: This method can also be used on the stove top in a cast iron pan. You can use the bricks to weigh it down or another heavy cast iron pot on top of the chicken. I've never tried it myself, but there are tons of recipes out there! Love the idea of the cornish game hen in a panini press, although I don't own one myself. If I ever buy a press, I'm going to keep that in mind for sure! I CANNOT wait to try this!! We are going to do this tomorrow night! Since tonight we are having grilled veggies and steak!! Yummo and kudos Nicole! You are amazing! 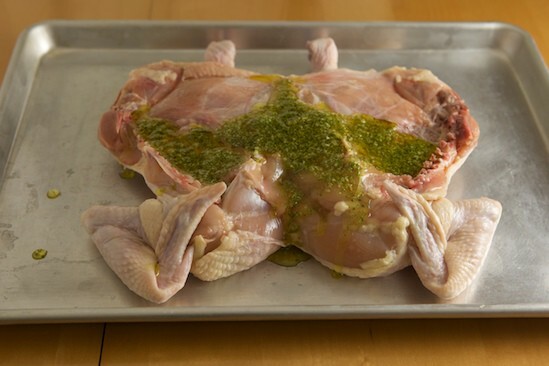 Has anyone tried the "leaping frog" method of flattening a chicken? Pushing the legs down and then cutting through the ribs along the breast to the shoulder? I leaves the breast on one side and legs below, looks like a frog - hence the name. This saves the backbone for those who like to pick at some of the meat along that area. It saw it in a recent Gourmet magazine. I love brick chicken!! Another way I love to do it is with a compound butter under the skin or the marinade poured under the skin.Nicely done and love your photos!! Chicmn cooked under a brick is a perfect combination to showcase a moist and juicy chicken. Thanks so much for the step-by-step! Very informative but beautiful as well. Yum! I have been wanting to make one of this for soooooo long. 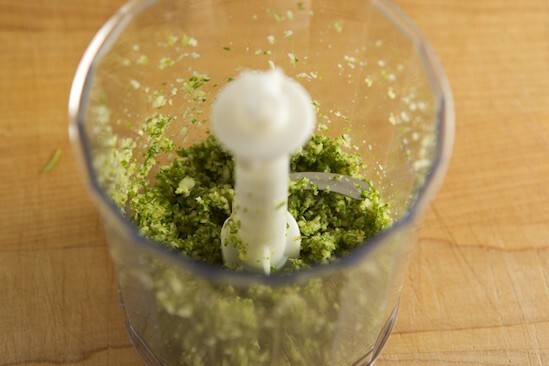 Love the pesto with yours and wishing I had one of those mini processors. Another excuse to run down to Great News! and spend $$$, right? Wow! I'm going to have to give this a try. I just joined a meat CSA and will receive two chickens a month as part of our meat share. The thought of roasting two of them in the house per month during the summer sounds awful! Butterflying & grilling might just be the perfect solution! Thank you!!! I always felt that there was a big difference between chopping (by hand or processor) and pounding hardy herbs like rosemary. 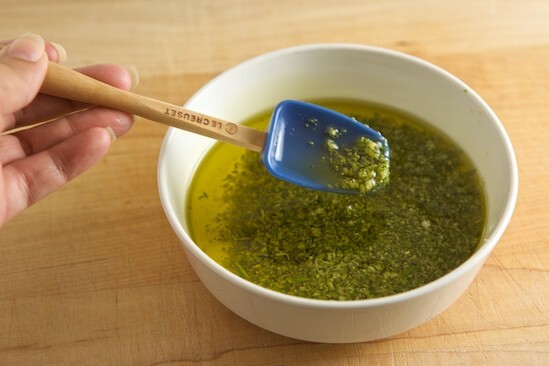 It looks to me that the pounding process releases more of the oils/scent of the herb simply because it is bruised on its entire surface as opposed to being cut/chopped which only makes smaller pieces.I am pounding the dayligh out of all my herbs, or garlick in my stone mortar and pestle that I cannot live without.Pollo al Mattone is a classic - but Nicole, why gas grill?!?!? !gabi @ Mamaliga. Excellent post!! It's been ages since I've prepared chicken this way. In addition to a rosemary-garlic oil similar to yours we used to slip thin slices of lemon under the skin just before grilling to give a nice citrus hint to the chicken. Wow, it came out great! I love the smoky flavor grillingl brings out. So this is the kind of stuff you've been up to this summer. How fun! I've always wanted to do this one... and beer can chicken too :) Looks like it turned out wonderful! I tried this last night, but we had to cook it about twice as long. I think our grill wasn't as hot as yours. It was wonderful! Robin: Glad it turned out well! Yes, I'm sure the cooking times will vary from grill to grill and will also depend on the size of the chicken. Thanks for pointing that out! An absolute masterpiece!! This is a good high protein low fat dish that looks very tasty. I am catching up on your blog and I just made chicken like this last week! Minus the bricks and with this (http://bit.ly/j2VOi) marinade - so I guess it wasn't really like it at all. 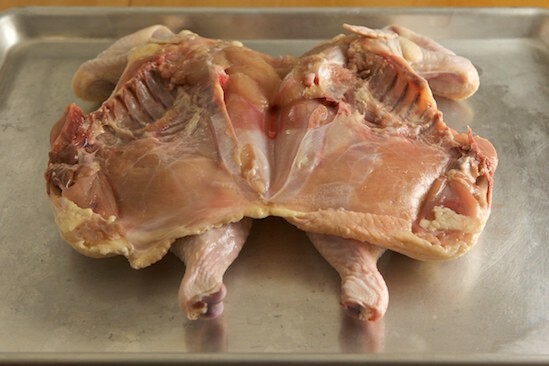 This is a great way to cook a whole chicken. I usually cook them in the crock pot but I will definitely be doing it this way instead - even in the dead of winter. I will be the crazy lady out grilling when its below freezing. Beautiful pics! Hi Nicole- I'm an intern at Foodista, so I see a lot of food blogs on a daily basis. However, few (if any) I have come across document the process of the meal as well as you do! I am absolutely blown away by your gorgeous step-by-step photography. I love how you included the instructional video as well- you genuinely seem to want other people to cook. Love it. Cool, never knew you could make chicken like this. It looks so delicious. Can't wait to make it. Having this tonight, used a thick garlic, parsley, olive oil, s&p marinade, which I'm also using to baste and roast my boiler onions, potatoes and baby bella side! Yum! Thanks! My wife loves the pope's nose and back portions, so I'll just butterfly the bird as per the excellent video and also put the pope's nose/spine/neck on the grill along with the rest of the bird under brick. I'm sure the entire bird will turn out lovely! Thanks for such an excellent instructional video...way better than one site I've visited where the buddy is cooking in his mobile home on a sterno stove and videotaping his cooking diary! Whoot! Take good care and grill on! Dan, I think anything 3.5 to 4.5 pounds would work well. I just found this blog today and went out and got a young chicken that weighs 3.83 pounds and it feels like it will be plenty for me and my husband with leftovers.The marinade alone smells SOOO good. I also think using a food processor works much better than chopping. I don't have a mini food processor, but my full-sized one worked fine with very little hassle. Thanks Ruth. I may have gone a little big. The one I picked up is about 4.5 pounds with giblets, etc. so it'll probably work fine. Really looking forward to giving this a go tomorrow. I'm tackling halibut fillets for the first time tonight, chicken under a brick for the first time tomorrow. Should be fun. Looks fantastic! And the skin side (to me) looks perfect. And, I love all the pictures. This is by far my favorite way to cook a chicken, even if the last two didn't look like food magazine covers. I skip the bricks, though, and use a cast iron skillet. I heat the skillet on the grill and even roast potatoes in it while it is weighing the chicken down. we/re making this tomorrow. love the pictures, great asset. Hi! Love the recipe, love the pictures. I feel much more secure making a recipe for the first time if I can see what each step should actually look like. Here's hoping for a delicious recipe that my family will love! Boom skahaalka boom boom, problem solved. So I finally had access to a grill to try this on and it did not turn out so good. The skin kept dripping onto the fire and flaring it up, burning the bird. We ended up having to pull the weights off and cooking it on the top rack. How do you keep this from happening? Lovely! Done this twice now, but I'm inclined to omit the marinade next time, and maybe just rub with salt for an hour or two. Nice photos, by the way.The word for spreading a chicken in this way is 'spatchcock'. Love this method/ Instead of brick I am using my lodge cast iron grill or Lodge fry pan, depending on how big the chicken is. It works beautifully. I have also found that Moscato wine with rosemary, garlic and salt makes a perfect marinade. 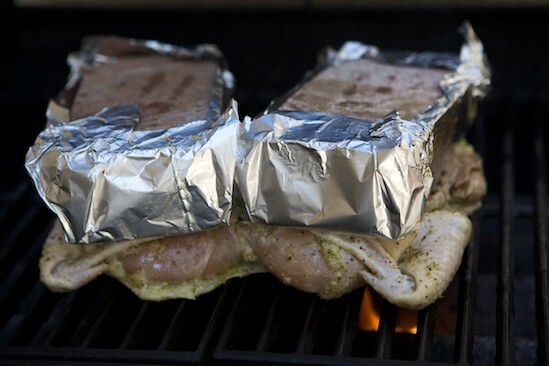 How about flipping the foil-covered bricks over to the clean side when you've turned the bird skin-side-up? Problem solved!